So yesterday I took a few skeins, and made them into cakes of yarn, ready for knitting. One skein that got caked up with this one—from January of last year. The colors are pretty intense—and while the original plan was for socks—I was never really sure. Well watching the colors run through my fingers as I cranked the ball winder—I though of autumn—Dark green hemlocks, blue spruces, and other conifers, set among the blazing colors of maples, oaks, ash and beech trees. Riots of color—Autumn in the Adirondacks. And what better for autumn (even though its now spring! )but a pretty cowl. A channel island cast on—and a bunch of stitches. When all was said and done—170 stitches—so a 17 stitch repeat—chevrons—came to mind. 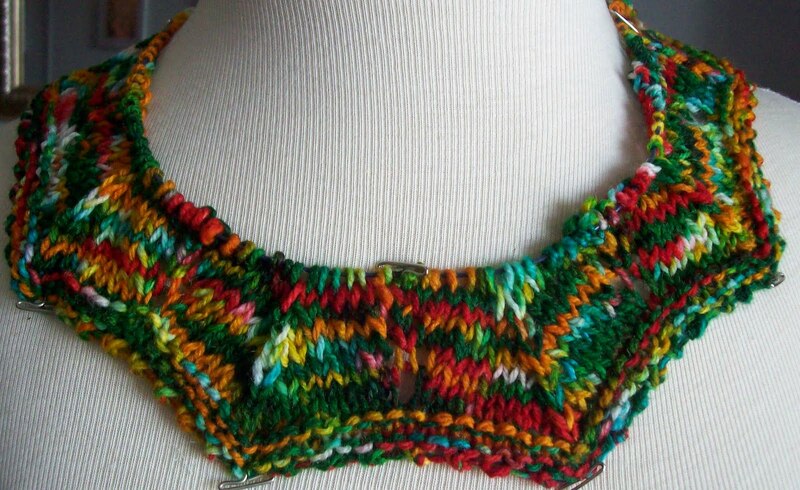 Partly because I though the cast on was too long (too wide) and wanted to pull it in—and chevrons will do that! Speaking of chevrons they are named for the Cheviot Mountains in Scotland—which geologically speaking are part of the same Appalachians chain of North America—from Georgia, north to Maine, into Canada, and then-- thanks to the mid ocean rift—torn apart—but appearing once again in Scotland and even the main land of Europe—So from West Virgina, to Pennsylvania, to Nova Scotia and into Scotland and the south of the Netherlands--coal-- and coal miners! Von Gogh portrait of the potato eaters could be set in many a small coal mining town in the US as easily as it set in the Neatherlands—geological its all the same stuff! That's the problem with picking up yarn—you end up wanting to knit it—RIGHT NOW! But the skein is just 100gm/less than 400 yards. This won't be a very big cowl—or take very long to knit, either! Wilder in colors than I would normally like, but this is so pretty knit up! Good choice of pattern to take the wilds. I love how the colors inspired your knitting, and the background story too! Love the colors! It will definitely make a pretty, and exciting cowl. And I enjoyed the geography lesson too! I live in Georgia where the Appalachians start and my family heritage is Scottish! What a cool connection.